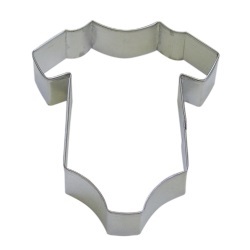 Navigate: StoreFront / Cookie Shop / Cutters / Baby Onesie Cookie Cutter - 4"
Baby Onesie Cookie Cutter - 4"
In a large bowl, cream butter and sugar with an electric mixer. Beat in egg and vanilla. Mix baking powder and flour, add one cup at a time, mixing after each addition. The dough will be very stiff; blend last flour in by hand (if dough becomes too stiff, add water, a teaspoon at a time). Do not chill dough. Divide dough into 2 balls. On a floured surface, roll each ball into a circle approximately 12 inches in diameter and 1/8 in. thick. Dip cutters in flour before each use. Bake cookies on an un-greased cookie sheet for 6-7 minutes or until cookies are lightly browned. Makes 20-24 average size cookies. NOTE: Dough can be tinted with icing color. Add small amounts until desired color is reached. For chocolate cookies; Stir in 3 ounces melted, unsweetened baking chocolate. To make this recipe Gluten-Free: I use the same recipe when making these gluten-free. I replace the All-purpose flour with the Better Than Cup for Cup Blend. You can find this recipe at www.glutenfreeonashoestring.com. Metal cookie cutters should be gently hand washed and then quickly dried to prevent rust. To ensure that all nooks and crannies are dry, place the cookie cutters (rolled edge on top) on a clean baking sheet in a warm, turned-off oven for a few minutes.